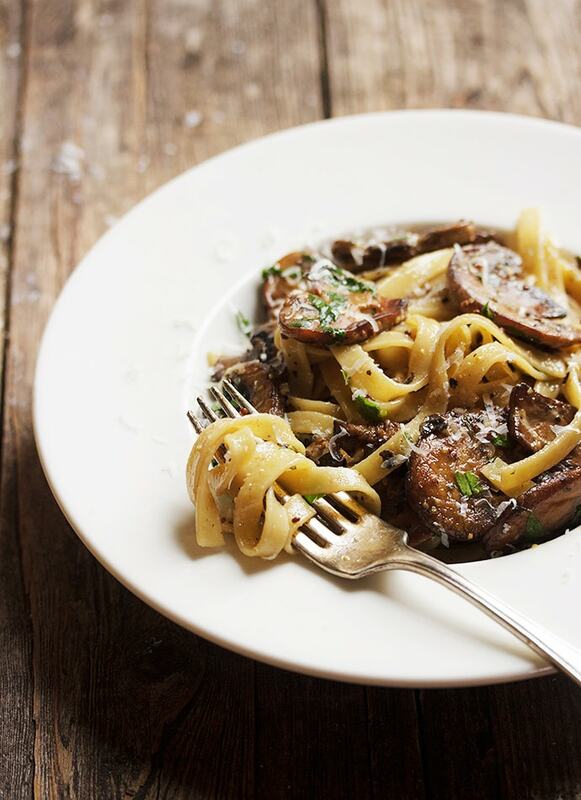 A delicious pasta, this Pasta with Mushrooms in Mustard Sauce is a mushroom lovers pasta, with golden, pan sauteed mushrooms and a delicious creamy mustard sauce. 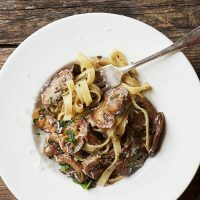 This is one for the mushroom lovers and a great meatless main that can be made with only a few simple ingredients, including grainy mustard, which is one of my favourites for flavour and texture. I love to make this with a mix of mushrooms, so I usually pick up some crimini, button and a few fresh shiitakes. Any sort of mushroom will work though. What’s more important than the type of mushroom used here, is taking the time to pan saute them to golden goodness. To do that, I saute the mushrooms off in batches – usually 2 or 3 batches, depending on the size of your skillet. Add a layer of oil to the pan that thinly covers the bottom of the pan and heat it over medium-high heat until it shimmers. Add the mushrooms and arrange in a single layer. Let them cook until golden, then flip. Remove to a bowl and repeat with the remaining mushrooms. Beyond the preparation of the mushrooms, the rest of the dish comes together super quickly. 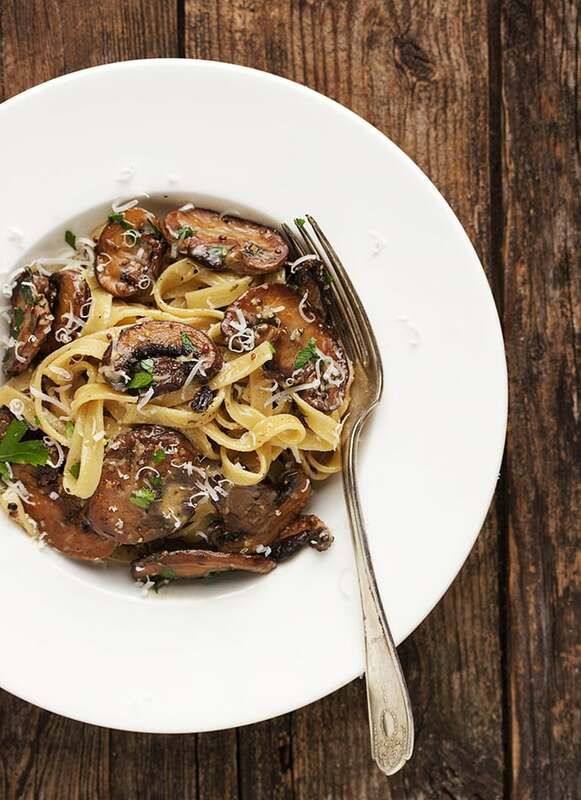 If you are looking to save some time at dinner time, you could saute the mushrooms ahead and refrigerate, then just finish the dish as the pasta boils. Be sure to salt your finished dish well. 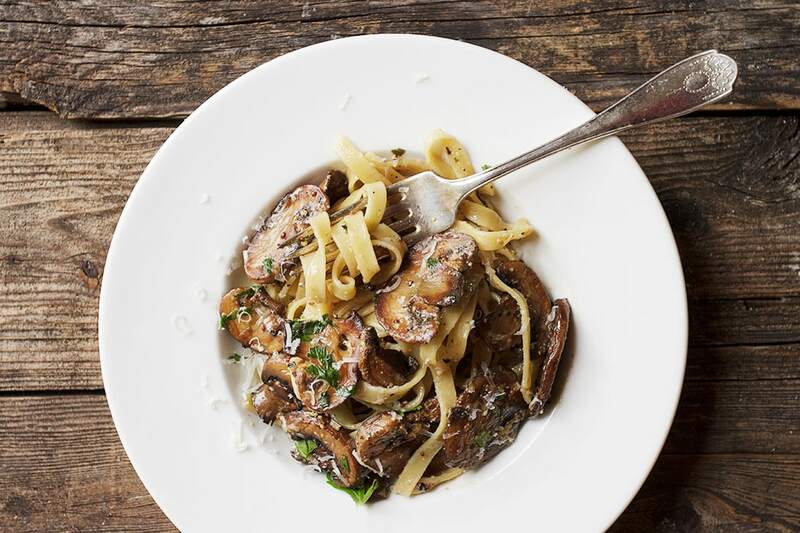 Mushrooms and a good salting is a match made in heaven. If you have a nice finishing salt around, like Maldon’s, now’s the time to bust it out! Use any type of pasta you like. I used tagliatelle here, but linguini or fettucine would also be nice. 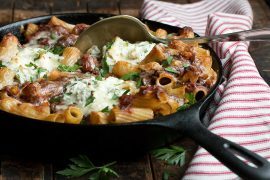 A mushroom lovers pasta! Use whatever kind of pasta you like - enough for 2 servings. I used tagliatelle, but linguini or fettucine would also be nice. Be sure to cook your mushrooms in batches so they will be beautiful and golden. Use button, cremini or mixed mushrooms. Salting the finished dish well, will really bring out the best in the mushrooms. Saute the mushrooms: Add oil to a large skillet to make a thin coat over the entire bottom of the skillet. Heat oil over medium-high heat until it shimmers. Add 1/2 of your mushrooms and arrange in a single layer (they should all lay flat with a bit of space in between.) Allow to cook until the underside is nice and golden. Flip over and brown the other side. Once golden brown on both sides, remove mushrooms to a bowl and repeat with remainder of the mushrooms. Remove/reserve 1 cup of pasta boiling water from pot then drain pasta and add to skillet with mushrooms and sauce. Add about 1/3 of a cup of the reserved pasta water. Over medium heat, cook, tossing the pasta in the sauce, until the sauce thickens slightly and coats the pasta. Add more pasta water if necessary. Add the freshly chopped parsley and toss with pasta. Remove pasta to serving plates or bowls. Serve garnished with the additional grated Parmesan and a finishing sprinkling of salt and freshly ground pepper as needed. After buying the grainy mustard I made the dish last night and we really enjoyed it. I used oyster and cremini mushrooms. Thanks for another tasty recipe. So glad you enjoyed it Liza and I think you’ll love having that grainy mustard around. I use it for a lot of dishes, as well as great on sandwiches! Hi, I am not sure what you mean by a grainy mustard. Would Dijon be considered grainy? I have made this twice and I changed the method up slightly the second time. I cooked the pasta, drained, then tossed in a bit of olive oil to prevent sticking. I then coated it well with single cream. For the sauce, I fried up the mushrooms in batches and then added in the white wine, mustard and herbs as instructed but omitted the cream and Parmesan. Once the pasta was ready, I then poured over the mushroom mixture and tossed it all up in a big bowl. We then put lots of Parmesan on the table to serve. It is also vey good this way. Just made & enjoyed this delicious pasta. Sautéing the mushrooms was a mission as using 2 regular cast iron frying pans, it took both of them being filled 5 times! Once that hurdle was finished, the rest went very quickly. I may increase the mustard & tarragon the next time, just for more bite! Tasty!! Great work Jennifer! I am in Nova Scotia. I’m going to make this for my book cub dinner I’m hosting. I think I’ll add toasted walnuts and baby spinach to the dish. Boy, I can’t wait to have this meal! next on my list to make! luv ‘rooms. your directions re cooking mushrooms reminds me of Julia Child. her instructions in her books & from the movie Julie and Julia where Julie cooked mushrooms as part of her venture. I didn’t think it made a difference but when I did follow, the difference makes the ‘rooms fantastic with no water, etc. This recipe was really easy to make and delicious! Making pasta with mushrooms now! !…so excited…omg..(Im at Seneca with Kieryn joy!!! )…cant wait for dinner!!…. I made this a few nights ago, and it was even better than i expected ! I was particularly delighted of how the mushrooms absorbed the white wine flavor — and the final result was totally worth forcing myself to be patient while sautéing them. This really is a great recipe. 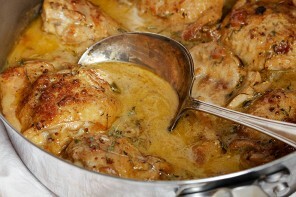 ok I have just pinned 10 recipes or so. . gorgeous gorgeous blog. . so glad I found you today! Oh my, your photos are so pretty! And this dish looks amazing. I love this kind of pasta! This is making my mouth water! I can’t wait to make it for my family! Thanks for sharing!! Thanks Kelly! And speaking of things that look good, I think I saw a cake of yours today somewhere (Instagram? Dulce de Leche?) that I must find and make immediately! 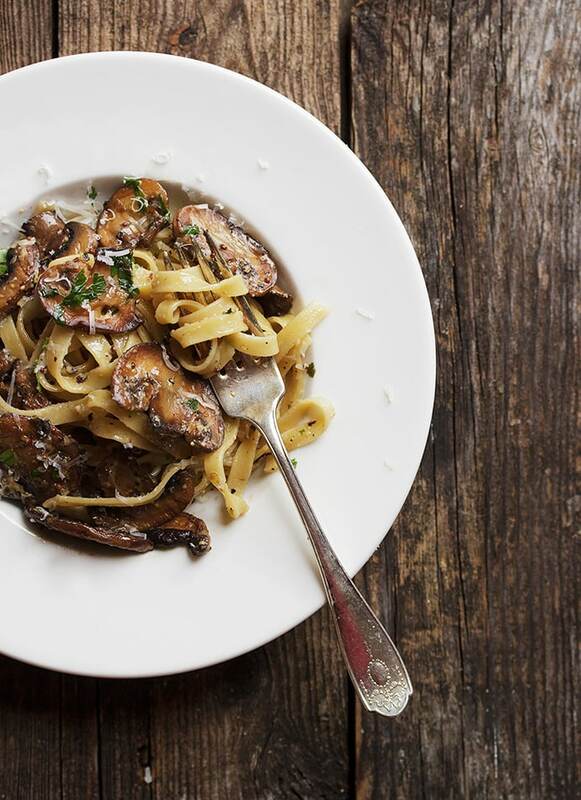 I LOVE mushroom pasta! 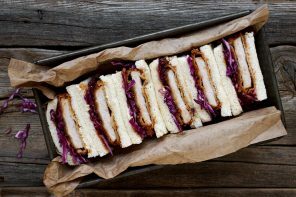 Definitely will be recreating the recipe for my vegetarian household… thanks for the idea and recipe Jennifer! Thanks Thalia. You will love this one! What a cool looking pasta! Thanks so much, Alexandra. You’ll love this if you’re a mushroom lover! Thanks Katrina … and bon voyage! :) Can’t wait to see your posts from Sicily. Totally mushroom lover here – and my boyfriend is a mustard fanatic! You’ve basically made the perfect dish for us. I must try this! Oh I’d eat my weight in this pasta! Adore the mushrooms and creamy mustard combo!